Writer-director Stephen Norrington’s hip morality play on the desire for fame and the effect of failure on one’s life manages to be entertaining despite the dark turns it takes. The DVD from Palm Pictures has a surprising amount of special features that make this disc worth a look. 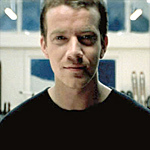 Billy Byrne (Max Beesley) is obsessed with the ticking clock. He’s calculated how many months, weeks and days he has to make his mark on the world (assuming he lives to be 90). Billy is on the verge of becoming the Next Big Thing (although we never actually find out what he does), but gets caught in a downward spiral when his work is poorly received. After becoming homeless, friendless and virtually penniless, he is taken under the wing of a young homeless woman, Anna (Emily Corrie). She lives in catacombs straight out of Oliver Twist, with a bunch of kids and Grimshanks, a latter-day Fagin, who doles out drugs to the gang to reward their thievery. Billy is horrified by their lifestyle at first, but within a year, he has embraced it. Billy doesn’t like what he has become and struggles to find a way out. The Last Minute has a good sense of the absurd, as when Billy is mugged by a convenience store clerk. Norrington’s over-the-top style sometimes works and sometimes doesn’t. Anyone who isn’t grossed-out by Prosthesis, the ultra-hip, ultra-decadent club Billy goes to, will find it hilarious. But the musical numbers by Percy, the baddest of the movie’s bad guys, are a little too sadistic to be funny. Although the movie is shown letterboxed, it is obvious in the opening credits that some of the picture was cut off in each side. Although this isn’t a major distraction, parts of faces that looked like they should have been in the frame are cut off. The DVD offers Dolby Stereo and Dolby 5.1. The 5.1 sounded very good on our home theater, particularly the thumping music in the club scenes. The disc includes two commentary tracks, by Norrington and Beesley, which can be reached through the set-up menu. Norrington’s commentary, which is the more interesting of the two, is above average; he talks about the challenges of shooting a low budget movie, the autobiographical aspects of the story and sheds some light on the symbolism. The disc contains several behind-the-scenes featurettes on the production and the look of the movie. It also has the theatrical trailer, three music videos, footage of the television shows seen in the movie and Mutantos, a ‘50s-style monster movie which was cut from the final version. The biggest problem with the special features is finding them. One way is to highlight the ? on the lower right hand of the special features menu. The other way to the features is a larger button that is unlabeled. Occasionally the navigation can be a little tricky. Accessing the cast and crew biographies, for instance, requires pressing play instead of enter. According to the Internet Movie Database, The Last Minute has only played at film festivals. It’s too bad, because the movie is entertaining and could have found an audience had it gotten theatrical release. Hopefully, the new DVD will give it more exposure.